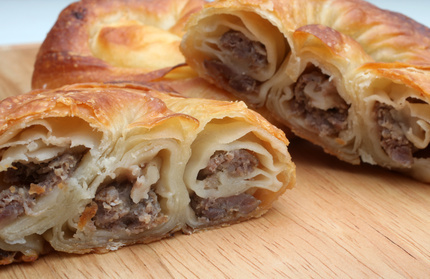 Here’s a selection of some Croatian recipes you can try in your own home. Croatian food is normally simple peasant food, which is easy to prepare but delicious nonetheless. People from the Croatian Adriatic eat food that is very similar to Italian cuisine. As the authors come from Northern Croatia (Koprivnica, north-east of Zagreb), where dishes are similar to those of Central Europe (Austro-Hungarian), here are a few recipes of meals typical of that region. Please note that some recipes are simplified for quick cooking, and normally people in Croatia would not think about using canned or pre-prepared items. But, read on – here’s some Croatian recipes for you to try! it at a temperature of 180ºC/350ºF for 30 minutes. This dish is even better reheated the next day. with water. Simmer gently and just before it is completely cooked, add pepper, sour cream mixed with flour, the chopped parsley and vinegar to taste. Here is an Istrian version of the popular Italian peasant soup. Peel and cube the potatoes, slice the bacon and sausage and chop the onion, garlic and parsley. Heat a little bit of vegetable oil and sauté the sliced bacon, onion and sausage. Sprinkle with red paprika and add the potatoes, vegetable seasoning, bay leaf and the salt and pepper. Dust with flour, stir well and add a necessary amount of water. Boil gently until potatoes have softened. Add chopped parsley and garlic and if desired, add 200ml (8 fl. oz.) of sour cream. Bring briefly to the boil and serve. This simple dish is very popular in Croatia and it is eaten as a light lunch, usually with a piece of bread and a glass of red wine. Wash the fish under the cold tap. Roll in the flour and deep fry in oil until crispy. Lay on kitchen towel to get rid of the excess oil and serve hot or cold with a slice of lemon. Wash and dry the shank halves and rub with a mixture of salt and pepper and the vegetable seasoning. Sprinkle with freshly ground pepper and set aside for at least an hour before roasting. Chop the onion and garlic. Arrange the meat in a roasting tin and smear with hot oil. Put the meat in the oven, pre-heated to 200ºC (392ºF) and cook for about 2-2.5 hours, depending on the size of the shanks. Turn the meat from time to time, basting it in its own juices and occasionally adding a little hot water so that the roast is kept juicy. When the roast is half done, add onion and garlic to the roasting tin. Just before it is cooked, pour the beef stock over the meat. When cooked, place the shank halves on a warmed platter. Stir the flour into the roast juices, boil briefly, add the wine, boil again and the strain the juices and pour over the roast meat. Served with boiled potatoes, sauerkraut or sour turnip and accompanied by a glass of good, red wine, this is a dish to savour long after it has been eaten. This dish, of Turkish origin, is very popular in Croatia as a light meal which people buy to eat on the go. There is also a cheese version. Fry the finely chopped onions and minced meat in oil. Add the salt and pepper. Grease a round baking tray and put a layer of pastry in it. Cover with a thin layer of filling and cover this with another layer of filo pastry which must be well coated in oil. Put another layer of filling and cover with pastry. When you have five or six layers, cover with filo pastry, bake at 200ºC/392ºF for half an hour and cut in quarters and serve. Soak the dried cod in warm water for an hour. Remove from the water and beat the fish with a wooden mallet so it becomes slightly tender. Put it back in the warm water again over night, before beating it once more so it becomes more tender. Scrape off the scales and rinse it under the tap. Cook until soft and then cool it and taken any bones out and slice it. Season with salt, pepper, chopped parsley and garlic and add some stock in which the fish was cooked. Mix all the ingredients well together. Serve either with polenta or boiled or mashed potatoes. Prepare a baking tin (20 x 40 cm/8 x 16 inches). Grind the walnuts and poppy seeds. Clean and wash the raisins and put them in rum to soak. Melt the butter. Clean, wash, peel and grate the apples. Beat the eggs. Place two sheets of pastry into the buttered baking tin, sprinkle with melted butter, with half the ground walnuts, sugar and cinnamon and top a dollop of sour cream. Second layer: a further two sheets of pastry, sprinkled with melted butter, half the grated apples, sugar, cinnamon and sour cream. Third layer: pastry sheets, sprinkled butter, half the raisins, sugar and sour cream. Fourth layer: pastry sheets, sprinkled butter, half the ground poppy seeds, sugar, cinnamon, sour cream. Repeat the layer sequence until the final layer (the eighth), which contains ground poppy seeds, and cover with two sheets of pastry. Next, mix the beaten eggs with the remaining sour cream and pour this mixture on top of the pastry. Pierce the pie in several places with a fork and bake for about 50-60 minutes at 200ºC/392ºF. Mix all the ingredients for the dough together and knead well. Cover the dough and put to rise until doubled in size which should take about 2 hours. Knock back the dough and knead lightly. Divide the dough into two equal pieces; roll each piece into an oblong about 12 inches by 8 inches. Mix the filling ingredients together and divide between the dough, spreading over each piece. Roll up the oblongs as tightly as possible to give two 12 inch sausages. Place these side by side, touching each other, on a greased baking sheet. Cover and leave to rise for about 40 minutes. Heat oven to 200ºC (425ºF). Bake for 30-35 minutes until well risen and golden brown. Bread should sound hollow when the base is tapped. Remove from oven and brush the hot bread top with milk. Sift with a generous covering of icing sugar. Set the oven to 190ºC/375ºF. Butter and flour a 9/10 inch spring clip cake tin. Separate the egg whites and yolks. Whisk the yolks, adding the sugar and lemon juice, until it is very thick and creamy. Whisk the whites until they are stiff and fold them into the yolks, adding the grated chocolate, almonds and breadcrumbs alternately. Fold in the grated rind last. Bake for 50 or 60 minutes. When done, allow to cool for a little while before removing the cake from the tin. Place on a rack to allow it to cool completely. Set the oven to 180ºC/350ºF. Break the chocolate up into little pieces and melt. Butter and flour a rectangular cake tin. Cream the butter and the sugar until it is light and fluffy. Separate the egg whites and yolks and beat the egg whites. Beat the yolks into the butter mixture one at a time. Add the melted chocolate once it has cooled slightly and fold in the flour and the egg whites alternately. Spread the mixture into the cake tin and stud the top with cherries, without pressing them down as the will sink of their own accord. You can stone the cherries or leave them whole, depending on what you wish. Bake for 40/45 minutes. Leave to cool in the tin and cut into slices when cold.